An example is a local area network (LAN). Any given node in the LAN has one or more physical links to other devices in the network; graphically mapping these links results in a geometric shape that can be used to describe the physical topology of the network. Conversely, mapping the data flow between the components determines the logical topology of the network. In contrast, logical topology is the way that the signals act on the network media, or the way that the data passes through the network from one device to the next without regard to the physical interconnection of the devices. A network's logical topology is not necessarily the same as its physical topology. For example, the original twisted pair Ethernet using repeater hubs was a logical bus topology carried on a physical star topology. Token ring is a logical ring topology, but is wired as a physical star from the media access unit. Logical topologies are often closely associated with media access control methods and protocols. Some networks are able to dynamically change their logical topology through configuration changes to their routers and switches. The simplest topology with a dedicated link between two endpoints. Easiest to understand, of the variations of point-to-point topology, is a point-to-point communications channel that appears, to the user, to be permanently associated with the two endpoints. A child's tin can telephone is one example of a physical dedicated channel. In local area networks where bus topology is used, each node is connected to a single cable, by the help of interface connectors. This central cable is the backbone of the network and is known as the bus (thus the name). A signal from the source travels in both directions to all machines connected on the bus cable until it finds the intended recipient. If the machine address does not match the intended address for the data, the machine ignores the data. Alternatively, if the data matches the machine address, the data is accepted. Because the bus topology consists of only one wire, it is rather inexpensive to implement when compared to other topologies. However, the low cost of implementing the technology is offset by the high cost of managing the network. Additionally, because only one cable is utilized, it can be the single point of failure. In local area networks with a star topology, each network host is connected to a central hub with a point-to-point connection. So it can be said that every computer is indirectly connected to every other node with the help of the hub. 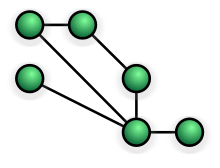 In Star topology, every node (computer workstation or any other peripheral) is connected to a central node called hub, router or switch. The switch is the server and the peripherals are the clients. 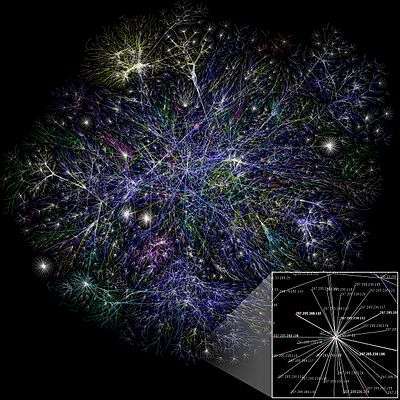 The network does not necessarily have to resemble a star to be classified as a star network, but all of the nodes on the network must be connected to one central device. All traffic that traverses the network passes through the central hub. The hub acts as a signal repeater. The star topology is considered the easiest topology to design and implement. An advantage of the star topology is the simplicity of adding additional nodes. The primary disadvantage of the star topology is that the hub represents a single point of failure. A ring topology is a bus topology in a closed loop. Data travels around the ring in one direction. When one node sends data to another, the data passes through each intermediate node on the ring until it reaches its destination. The intermediate nodes repeat (retransmit) the data to keep the signal strong. Every node is a peer; there is no hierarchical relationship of clients and servers. If one node is unable to retransmit data, it severs communication between the nodes before and after it in the bus. This makes it impractical for large networks. Hybrid networks combine two or more topologies in such a way that the resulting network does not exhibit one of the standard topologies (e.g., bus, star, ring, etc.). 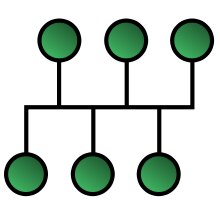 For example, a tree network (or star-bus network) is a hybrid topology in which star networks are interconnected via bus networks. However, a tree network connected to another tree network is still topologically a tree network, not a distinct network type. A hybrid topology is always produced when two different basic network topologies are connected. In a partially connected mesh topology, there are at least two nodes with two or more paths between them to provide redundant paths in case the link providing one of the paths fails. 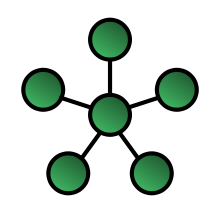 Decentralization is often used to compensate for the single-point-failure disadvantage that is present when using a single device as a central node (e.g., in star and tree networks). A special kind of mesh, limiting the number of hops between two nodes, is a hypercube. The number of arbitrary forks in mesh networks makes them more difficult to design and implement, but their decentralized nature makes them very useful. In 2012 the IEEE published the Shortest Path Bridging protocol to ease configuration tasks and allows all paths to be active which increases bandwidth and redundancy between all devices. 1 2 3 Groth, David; Toby Skandier (2005). Network+ Study Guide, Fourth Edition. Sybex, Inc. ISBN 0-7821-4406-3. ↑ ATIS committee PRQC. "mesh topology". ATIS Telecom Glossary 2007. Alliance for Telecommunications Industry Solutions. Retrieved 2008-10-10. ↑ Chiang, Mung; Yang, Michael (2004). "Towards Network X-ities From a Topological Point of View: Evolvability and Scalability" (PDF). Proc. 42nd Allerton Conference. ↑ Bicsi, B. (2002). Network Design Basics for Cabling Professionals. McGraw-Hill Professional. ISBN 9780071782968. 1 2 Sosinsky, Barrie A. (2009). "Network Basics". Networking Bible. Indianapolis: Wiley Publishing. p. 16. ISBN 978-0-470-43131-3. OCLC 359673774. Retrieved 2016-03-26. ↑ Bradley, Ray. Understanding Computer Science (for Advanced Level): The Study Guide. Cheltenham: Nelson Thornes. p. 244. ISBN 978-0-7487-6147-0. OCLC 47869750. Retrieved 2016-03-26. ↑ "Avaya Extends the Automated Campus to End the Network Waiting Game". Avaya. 1 April 2014. Retrieved 18 April 2014. ↑ Peter Ashwood-Smith (24 February 2011). "Shortest Path Bridging IEEE 802.1aq Overview" (PDF). Huawei. Retrieved 11 May 2012. ↑ "IEEE Approves New IEEE 802.1aq Shortest Path Bridging Standard". Tech Power Up. 7 May 2012. Retrieved 11 May 2012.